I had about 30 minutes to myself amongst an area of stranded icebergs. The sky was heavy with no wind. Magic starts to happen. I had to find it. Slowly I weaved my zodiac boat amongst …bergs and brash ice before finding this scene; two crabeater seals resting above the iridescent blue of a shallow ice foot of a berg. For me it captures the serenity, the wildlife, the colours and awe in one shot. 1 hour later I passed by again and the berg had collapsed – broken brash ice floated around and the berg in the photo had reared up on it’s side. Underlining that these places are highly dynamic dangerous places to visit. I’d captured an fleeting moment in the vastness of space and time that is Antarctica. What do other ‘Antarcticians’ think? I’d love to hear what the ‘essence of Antarctica’ means to you. Check out my other Antarctica photos here. We also have high quality canvas photo prints of Antarctica now available for ordering here. Rob, this is very nice. 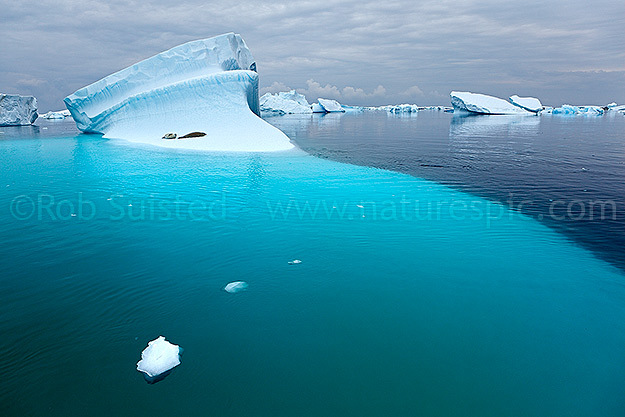 Love the ice floating over the submerged iceberg. Gives it a 3D like quality. Beautiful. Thanks for sharing. Hi Rob, Im not an Antarctican but hope to visit at least once in my lifetime. I agree with you, this photo is simply stunning. Welcome back to Godzone. The colors, the peace and unspoilt beauty you have captured brilliantly. When I see your picture I wish I was back in Antarctica. Nice shot. I like it how there are no penguins visible as they’re overrated smelly birds with anti-social habits. Just joking of course, but nice to see a view that doesn’t include them. WOW!! !, fantastic shot Rob. Must have been a great day in your life that one. You're reading Antarctica in one photo only at Nature’s Pic Images Blog.